A list of essential anamnestic questions that implicitly have to be applied to the patient at first contact is outlined. These questions already help to differentiate between a focal entrapment or a focal inflammatory disease. The importance of a correct assessment of symptoms and neurological deficits – as a next step – is pointed out. The use of new imaging techniques as an important supplemental step is described. Finally, when the involved nerve is clearly identified, palpation and percussion of the nerve course can easily elicit a Tinel sign. Reasons for the ability of this undervalued and neglected clinical sign to indicate the site of a focal entrapment and the damage level are subsequently elucidated. A further look is taken at pain-related focal neuropathies. The different nerve damage-related pain types are listed: neuroma pain and three different neuropathic pain degrees – hyperpathia, allodynia, and causalgia. Pathophysiological mechanisms that presumably contribute to the central nerve generated neuropathic pain types are discussed. We discuss why surgical procedures, which aim at nerve release, rarely succeed in cases in which a neuropathic pain type already exists. 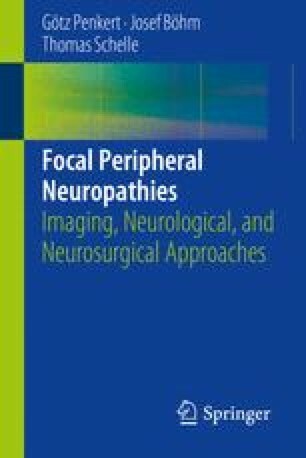 The value of current neuro-modulation techniques as an alternative as well as more successful treatment is pointed out. Finally, the Parsonage-Turner syndrome is mentioned as an initially rather painful nerve involvement syndrome frequently – without correct indication – operated on.